To start this post off… a few recent KinderQuotes! 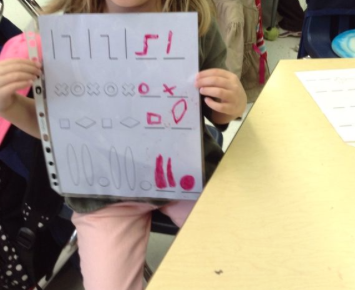 One of our students (we will call her Gracie) was at home sick. I have to say, I didn’t expect to get flipped the bird in Kindergarten. :p I couldn’t help but giggle at this occurrence. Today, I accidentally got called “Grandma” and “Mom.” This cracked me up to no end. Happy that I am comparable to the wonderful grandmas and moms out there! This hand signal. a closed fist, is “Turtle.” The students curl their bodies up like a turtle in its shell. This one (flat hand, palm out, thumb up) is “Shark.” The students make a fin above their heads and circle their table one time. 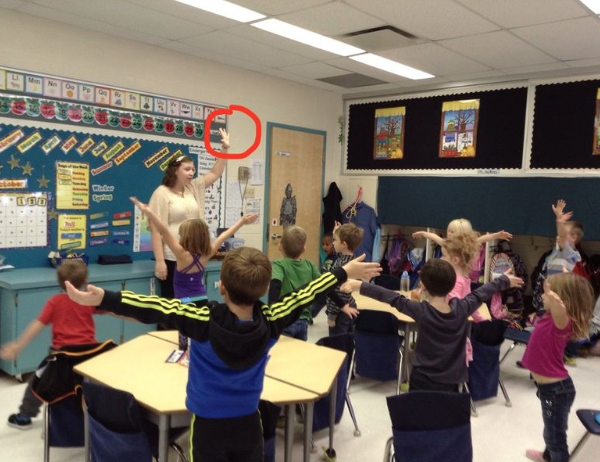 This (five fingers splayed) is “Starfish.” Students stand up and spread their arms and legs to make a star. The kids love these and even requested additional signals. 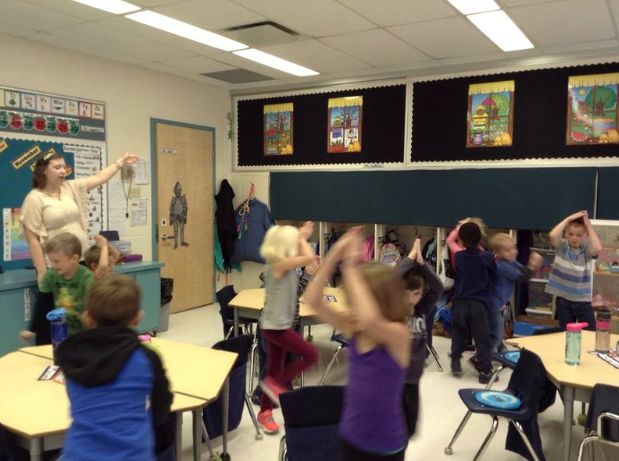 I have since introduced “Jellyfish” (thumb tucked in, four fingers pointing downward and wiggling), where students stand up and wiggle all of their arms and legs. I also did an impromptu talking circle and hope to incorporate these more often, as students are never quieter and more attentive than when their classmates have the special ‘talking stick.’ This is also culturally responsive and integrates Indigenous ways of knowing. I have been noticing a lot of students raising their hands to tell stories during morning routines. I wanted to think of a way to get them to hold their comments until a more appropriate time, but still be able to give them each a chance to share. Thus, Story Snack Time was born! I made a deal with students that if they can hold their stories until snack time (when we don’t “have a job to do”), I will circulate all of their tables and listen to a story from each of them. This has been amazing so far! Fewer interruptions and strengthened relationships all in one! I love being able to get to know these students’ personal experience and have one-on-one time with all of them each day. I think they are enjoying this opportunity to ‘be heard’ as well. Finally, I did a math lesson yesterday that was one of my best lessons yet. 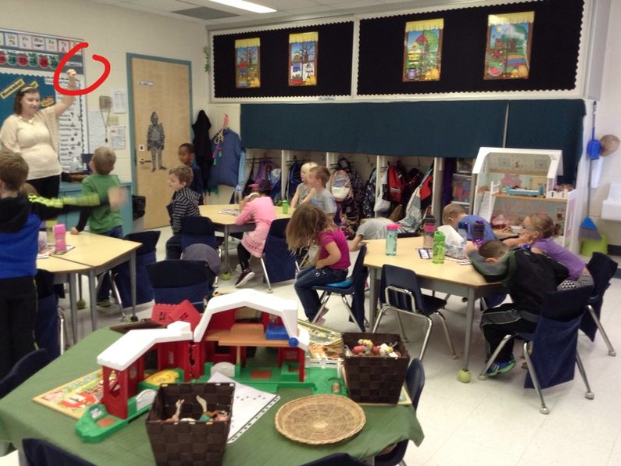 It was set up similar to our morning “Centre Time,” when students can freely choose what they would like to do. I was focusing on the skill of extending a pattern, and students had three different centres to pick from that all worked on this concept. At this centre, students could create a pattern with the manipulatives and have their peers extend it. Another centre had several different versions of these worksheets I created. I love putting these in page protectors so students can draw on them with dry erase markers and erase them later. Paper saver tip! The third choice was a pattern book full of worksheets that my cooperating teacher usually does during this unit. I was surprised at how many pages of the books some students were able to finish! Another example of me underestimating my little geniuses. This lesson was a hit with students! They couldn’t believe that they actually got to choose where they wanted to go. Some students jumped around a lot, and others stayed at one centre almost the entire time. I loved that students with different interests and strengths were all able to find a centre they liked. Some students are truly ready for the book work and pre-reading/writing skills, so they LOVED the workbook centre. 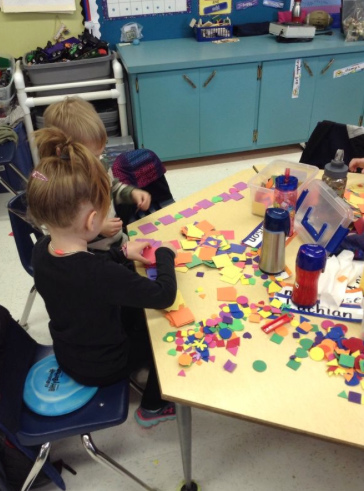 Others are very kinaesthetic learners, so ate up the hands-on manipulatives centre. I loved this lesson because I got to interact with almost all of my students in a different, yet meaningful, way. I learned so much about what they can do and what they like to do in a small amount of time. This is why I love centres and play-based learning – if offers a world of possibilities. I am going to try and do more student-centred lessons like this in the future. Oh, and another bonus: Almost ZERO teacher talk and whole class instruction time for students to sit through! Yes! Here are a few random thought blurbs I have had over the past week or two. When I was home over the Thanksgiving weekend, I was somewhat irked to hear that there was a Boil Water Advisory for the tap water, as the town is working on putting in an RO system. Later, I felt guilty for feeling so inconvenienced, as I realized that we take access to clean, safe water for granted. Not only do we get water at the flick of a tap, it is usually ready for our consumption, whereas others in the world walk significant distances to get water, or have to risk drinking unsanitary water every day. That was definitely an eye-opening moment for me. I just thought it was interesting to see how much things had changed since I was in my early childhood years. I think that today’s focus on play-based learning and exploration are so much more fitting for students’ developmental needs at this wonderful age. I finished my midterm assessment with my cooperating teacher today – what a strange feeling! I can’t believe that I am approaching 50% completion of my internship! I am happy to say that I have already grown so much since we did my pre-assessment at the Internship Seminar in September. I also targeted a few goals that I will be working on as I continue my journey! Stay tuned!